BETH LAFRANCE IS WEARY but well-pleased as she dusts the flour from her hands and hangs up her white apron after another hectic week crammed with luscious coffee cakes, humongous cinnamon rolls, and the smiling faces of customers eager to share snippets of west county gossip. Beth--who has risen at 3 a.m. each day for four years to bake her organic goodies fresh and warm for early-morning commuters--has her work cut out for her. She's the sole baker and a stickler for quality, so the work is hard, but the rewards are worth it. Customers at the small Sebastopol bakery, located in a neighborhood shopping center, can't get enough of Beth's specialties or her special treatment. In a world of rapid drive-thru lattes, faux-hokey corporate-owned diners, and Internet social lives, the aptly named Beth the Baker is one of those rarely encountered plain-but-cozy community hangouts that genuinely reminds one of home. Beth cooks in full view in her open kitchen, and it feels comforting to hear her clattering around over there while you settle back with a cup of coffee and a blueberry-filled scone or a slice of her original chocolate beet cake and watch the steady steam of customers stroll in. Actually, the patrons, who are warmly greeted by name, seem more like friends and extended family members. The true regulars even keep their personal mugs dangling on a homemade wooden rack behind the counter. The steady cast of characters at Beth's includes construction crews, cops, and city c pouncil members, all ready to sit and share their stories. One customer, a therapist who works across the street, has dubbed the shop "Cheers without the booze." We couldn't think of a more apt description. 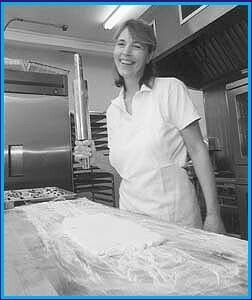 Beth the Baker, 171 Pleasant Hill Ave. N., Sebastopol; 823-1440. --P.H.